" Age spots, or solar lentigines (solar lentigo) are more commonly known as “liver spots” . They appear as brown or brown-black spots with grayish pigments, and are flat and well defined (usually oval) in shape. 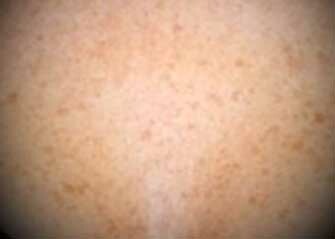 The skin spots usually appear after age 40 and are sun induced freckles. In sunny climates they start to appear at age 30 as the result of cumulative sun exposure. They often appear after a sunburn and on sun exposed areas of the body such as the face, forearms, hands, chest, lower legs and upper back. There is a higher prevalence of the condition in Caucasians and secondarily in Asians. The use of sunscreens may prevent the condition. Although these are often undesirable permanent skin changes, they do not pose a threat to health and do not need treatment, except to improve one’s appearance. The condition is not contagious. While true age spots are harmless and do not require treatment, it is possible that in some people brown spots or black spots or spots that have changed could indicate a skin melanoma or cancer. For this reason, go to a dermatologist for annual mole checks." Age spots are one or more small (1cm to 3cm) brown spots or macules that are due to skin sun exposure. Multiple macules usually appear in sun exposed skin areas. The common name “liver spots” may be misleading because age spots are not in any way caused by liver disease or malfunction. The more accurate term, solar lentigines, reflects their true cause, which implies skin damage due to repeated and prolonged sun exposure that increases with age. Although aging itself does not cause the age spots to appear, they are often found in people over 40 years of age because of the chronic exposure to the damaging effects of ultraviolet rays from the sun. For this reason, solar lentigines are commonly found in exposed body parts such as the face and forehead, back of the hands, forearms, and shoulders. Exposure to other sources of ultraviolet rays can also lead to skin damage that includes the appearance of lentigo. Solar lentigo usually occurs in people over 40 years of age, but appear in some people after age 30 that live in sunny climates. In sunny climates they can occur in people 30 years old. The condition is seen more often in caucasians followed yb Asians. 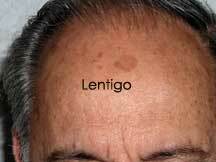 Lentigo is often seen in people with fair skin, but they can also develop in people with darker skin. 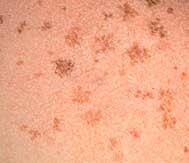 These brown spots may appear as freckle-sized spots but may become bigger, up to half an inch or one centimeter in diameter. They can also group together, making the brown areas appear bigger in size. There are no significant symptoms associated with the condition such as pain, itching, or discomfort. Having multiple colors such as dark brown, light brown or light yellow. The macules do not have a uniform color. 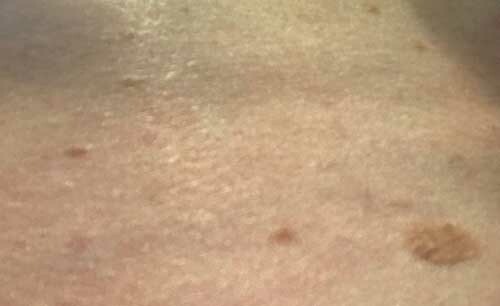 Age Spots Pictures That Appears in Skin Area After Sun Burn. Chronic cases show Dermatoheliosis (changes to skin due to UVA and UVB exposure) Solar lentigines of different sizes. A diagnosis is easily made by a physician upon physical examination, especially in people over 40, even without doing any tests. However, if the brown spots are irregularly shaped or multi-colored, a biopsy may be done to rule out other conditions such as skin cancer. As long as the brown discolorations on the skin do not bother the individual, no treatments are necessary. However, for cosmetic reasons many people seek treatment to improve their appearance with an over-the-counter bleaching agent. Dermatologists often prescribe retinol and hydroquinone (HQ) creams to lighten the spots such as Esoterica or Porcelana. Cream effectiveness is improved with a glycolic acid moisturizer such as Neutrogena Pore Refining Toner. These products reduce melanin production, making brown spots lighter in color. These products are also available as over-the-counter skin preparations in lower concentrations. Doctors also advise using exfoliating products which may contain salicylic acid, glycolic acid, or papaya extract. Skin brightening compounds or bleaching lotions containing licorice extract, bearberry, and hydroquinone also work with fruit acids to make the dark spots lighter. If using a concealer pick a skin tone that is lighter than your skin tone. Demonstration of laser treatment for treating age spots. When treating age spots, a Dermatologist will first try a 4% hydroquinone topical. It is used on the skin 2x a day for 3 to 4 weeks. Some Dermatologists also recommend a vitamin A ointment such as Renova or Retin-A. Age spot cryotherapy is used to fade liver spots through freezing using liquid nitrogen. It is safe and safe. In some cases it can lead to the treated area being lighter on color or it can cause the formation of a permanent white scar. Tell your Doctor if you are on any medications such as anti-inflammatories or blood thinners before undergoing treatment. Microdermabrasion or dermabrasion for shot involves the planing or sanding of the skin's outer layer. After treatment the skin surface will appear smoother with results that last for a long time. There are some small risks such as infection, skin tissue damage, skin color loss, skin irritation and scarring. Any skin swelling tends to be minimal. After treatment care is needed such as cleaning the treated area several times a day, avoidance of the sun. Treatment cost ranges from hundreds to a few thousand dollars. A chemical peel for age spots uses chemicals such as glycolic acid or trichloroacetic acid (TCA) to remove the outer skin layer. the result is a smooth skin surface and the elimination of any wrinkles. There are some risks such as a change in skin color, scarring and the return of cold sores. Lasers use a laser want to remove skin layers. It works by heat the skin layers, which results in the production of calogen. This promotes healing and a smooth skin appearance. Peeling refers to peeling away old skin cells and replacing them with new cells. After being treated you will need to clean the treated area and apply an ointment to prevent scabs. Healing lasts for up to 3 weeks. Expect swelling for one to two days after being treatment. Itching may persist up to 4 days. Laser peeling skin spot treatment costs $1,750 to $6,000. Microneedling or collagen induction therapy takes minutes to perform. It involves using a device which puts tiny needles into the surface of the skin. It is not used on the face. Treatment cost is $350 to $500 for each session. Clear + Brilliant Laser System: Fractional lasers are used at low-energy wavelengths. The laser is focused on the outer skin layer, leaving a uniform skin tone with little swelling or red skin. The treatment requires 3 to 5 treatments, every 30 days. Illuminase: The Illuminase treatment resulted in a 75% improvement in dark skin spots. Patients are treated for 12 weeks, 2 to 3 treatments a week using a mild laser and microdermabrasian for resurfacing. Patients also use a nightly application of a topical (Retin-A and hydroquinone active ingredients) for 30 days. Patients are also required to use a 40 SPF sunscreen every morning. Last, the over the counter treatment called Elure Lightening Lotion is now being used by Dermatologists in combination with laser treatment and skin peels. The cream is recommended for use 1 month prior to in-office treatment. Prescriptions are typically for creams that contain hydroquinone (bleaching) or tretinoin (acne cream.) Like other forms of treatment side effects can include skin discoloration, scarring, swelling, pain and bleeding. Note that many insurance plans consider lentigo or sun spot removal to be a cosmetic procedure which is not covered. What age spots treatment removal procedure should be used? Cost to remove liver spots? Recovery time and care after the procedure? Stay inside between peak sun hours which tends to be 10 a.m. to 3 p.m.
Use sunscreen of SPF of 30 or higher. Apply 30 minutes before heading into the sun. If swimming reapply sunscreen every 2 hours. Avoid tanning booths or tanning in general.